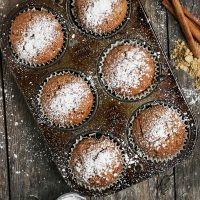 Delicious, spicy, moist and lightly sweet muffins, especially nice to bake up around the holidays. Preheat your oven to 350° F Grease or line 12 muffin cups. (I used paper liners, but the muffins didn't stick at all to them, so I suspect you'd have no trouble with just greasing the pans). In a large bowl combine the flour, sugar, baking powder, cinnamon, ginger, cloves and salt. In another bowl combine the eggs, vanilla extract, oil, honey, molasses and milk. Add the wet ingredients to the dry and mix with a rubber spatula just until combined. Don’t over-mix. Evenly distribute the batter among all muffin cups (I only got 11 muffins. I filled the empty muffin cup 2/3 full with water before baking to ensure even bakinand bake in the pre-heated oven for about 28-32 minutes, or until a tester comes out clean. Garnish with a generous dusting of icing sugar.